Type the project name or other information on the project you want to find. Click the Search symbol . The projects, which include the entered text, are displayed. All search results are also displayed on the side panel of each opened project. On the Start tab, in the Actual Views group, click Save to save the adjusted view of the project list. For more information on how to save a view, see Generate personalized views. The saved view will be displayed under Projects in the tree structure on the left part of the window. Choose one view, e.g. Projects: project manager view. You will see an overview of all projects to which you are assigned as a project manager. On the Start tab, in the Actual Views group, click Filter. 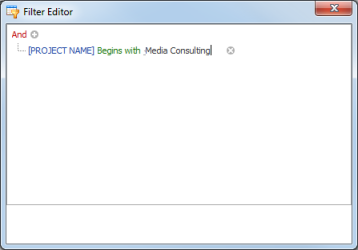 This invokes the Filter Editor dialof box, which allows you to build filter criteria. To learn how to work with Filter Editor, see the following examples. This example shows you how to create a simple filter criteria. When invoking the Filter Editor for a grid control, if no filtering has yet been applied, the Filter Editor will contain a new filter condition referring to the project view or side, where it was opened. The Filter Editor displays now the comparison operator (AND), the condition's link (PROJECT NAME) together with the logical operator (Begins with). Enter a text in the field behind the logical operator, e.g. Media Consulting. InLoox PM filters the projects by the selected criteria, e.g. Project name begins with. Click the logical operator (Begins with) and select OR from the list. Click the symbol Add to add another criteria. Click the condition's link (PROJECT NAME) and select the field NUMBER from the list. Click the logical operator (Begins with) and select Equals. InLoox PM filters the projects by the two selected criteria, e.g. Project name begins with OR Number equals. 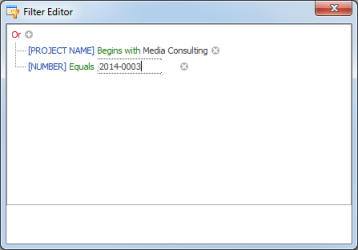 Use the symbols Add or Remove to create and customize filter criteria. All filter results are also displayed on the side panel of each opened project. How to use the search function in the InLoox PM 8 project list • Copyright 1999-2019 © InLoox, Inc. All rights reserved.